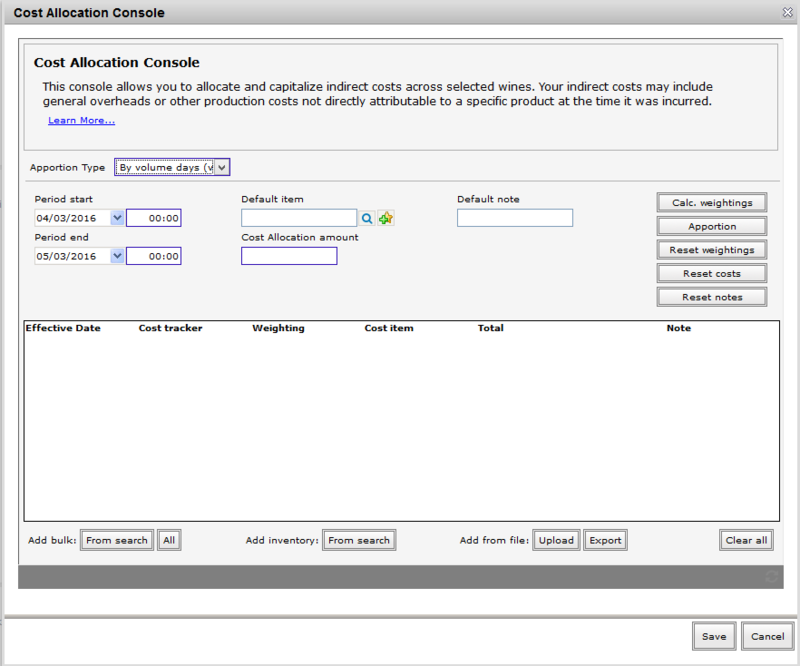 For customers with Costing enabled, Overhead costs can now be apportioned to your wines via the Cost Allocation Console. Before using the console we recommend setting up the cost items you wish to use. 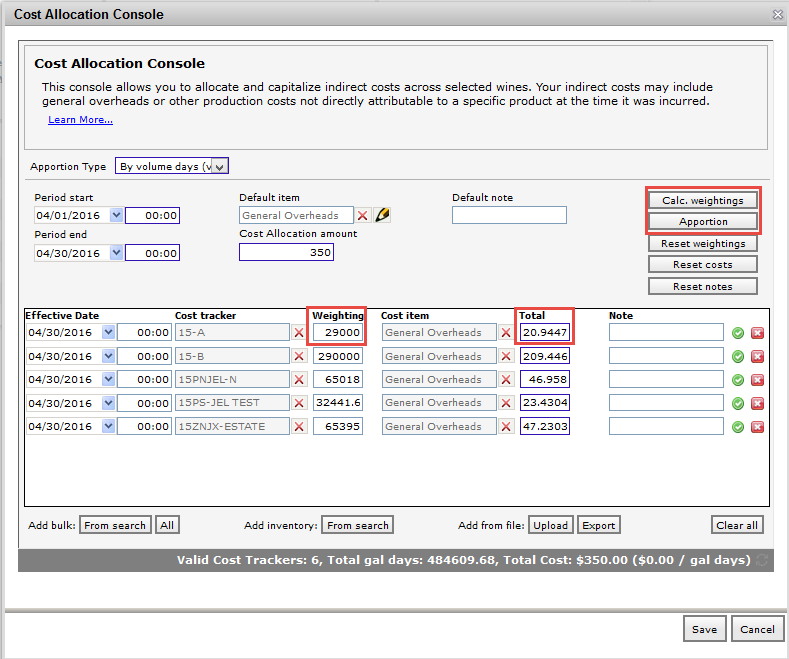 This can be done in the Winery Setup – Costing. 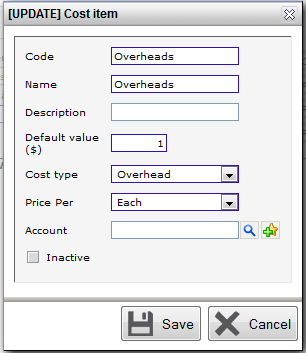 Add your new charge items, making sure you select the Charge type that suits; for example you could add overheads and cellar work labor costs as two different charge items using the same console. 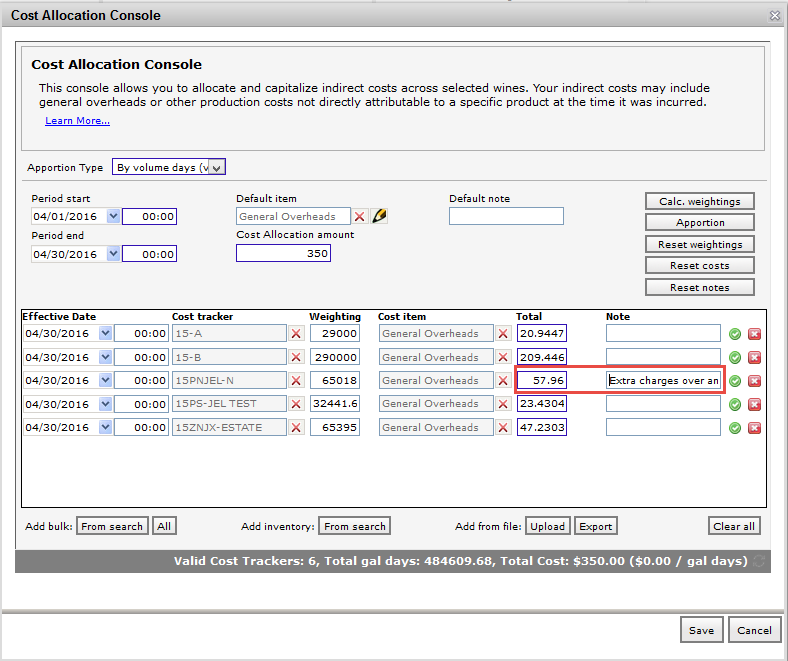 Once your cost item is configured, enter this as your default item. 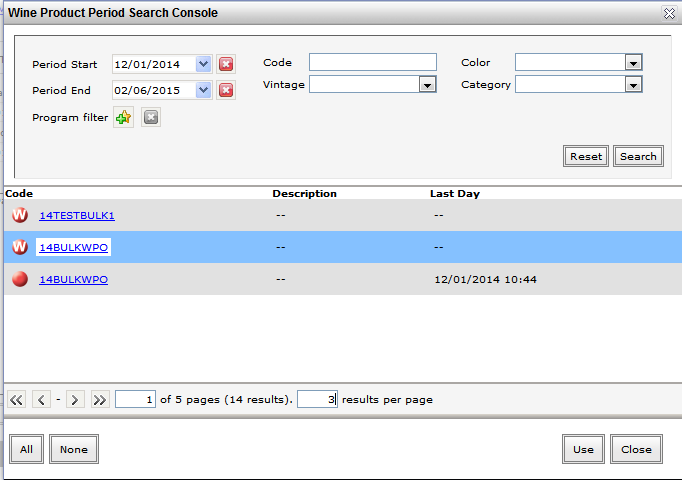 You can then populate the list from the Search fields at the bottom of the screen. You can include Bulk wine and packaged inventory in the same list. If you want to include all your wines click the ‘All’ button. By Volume (end of period) – The weighting uses the volume on site at the end of the period. By Volume Days (Vol x Days) – The total volume as it changes over time, picking up wine that is gone at the end of the period but on site at the start. Once populated each wine is given a Weighting based on its volume. You can then enter the monthly overhead amount and click the apportion button to allocate each wine’s share of the charges. Note: you can manually override the apportioned values. You can also search for specific bulk wines to apportion costs to. This search will show each wine as its state changes. If a wine is inactive in the system (either shipped out or blended into a new wine entirely) the result will have a date in the ‘Last Day’ column. In our example above, 14BULKWPO was listed as a bulk wine only as late as 1 December. You just need to select it and the weighting will be adjusted accordingly based on when it was removed. Once you have confirmed the Effective date is correct click the Save button and the costs will be allocated to these wines as of the entered date. Costs will be passed on as the wine or stock moves about the system allowing you to track these costs as the wine progresses through the production life cycle.